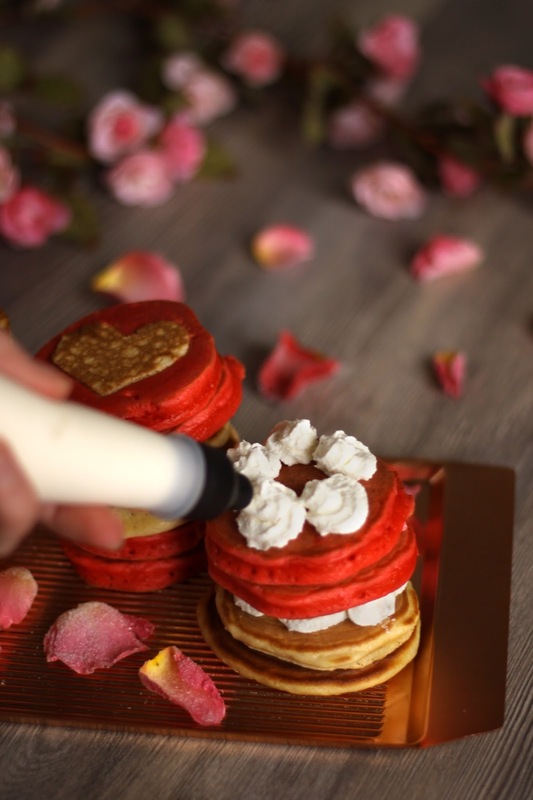 Here is a romantic breakfast idea for the special day. You still have no idea how to make a romantic surprise for Valentines day for your loved one? 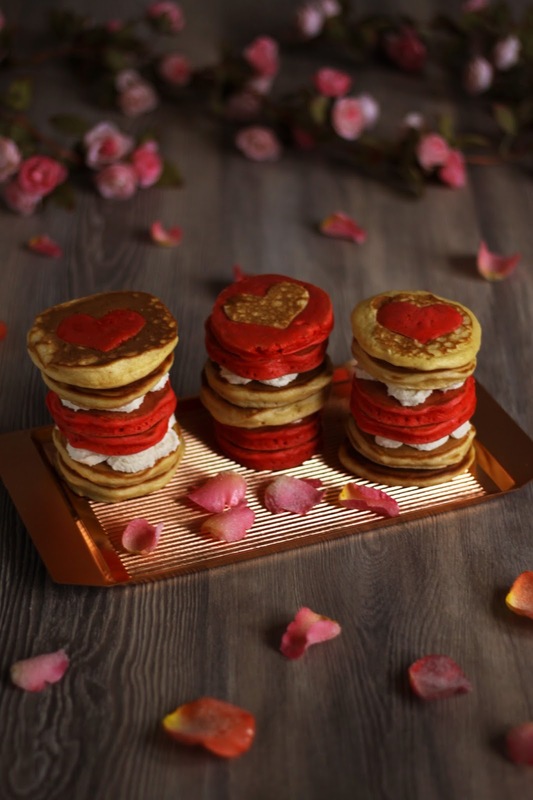 Don't worry, we've got you covered - make a stack of the most romantic pancakes in the world! The cream between the pancakes has a hint of ginger in it, for a subtle aphrodisiac effect. As a special twist we will be making sugar coated rose petals. Nothing says "be mine" like a stack of pancakes. This task takes dedication and time, but it is worth it! You will need to start one day before, since the roses need about 8-12 hours to harden up. It took us about two hours to make them - so turn on some romantic music to set the mood and let's get going! 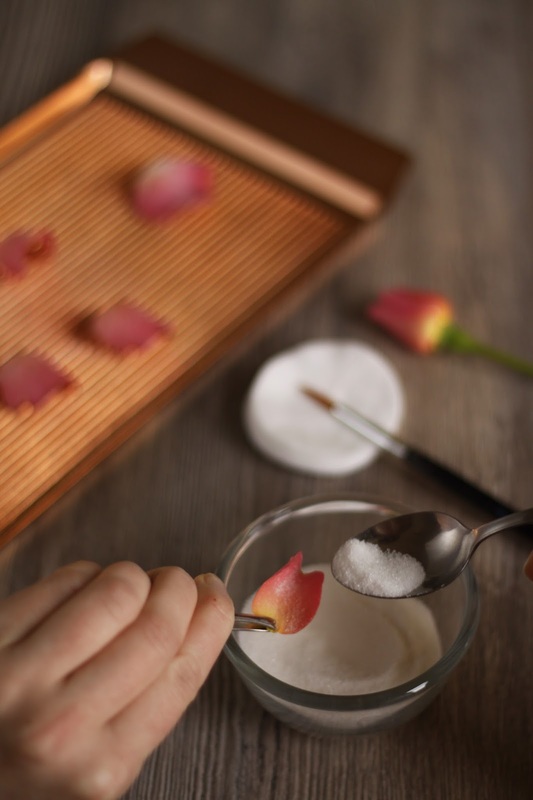 Start by carefully removing the rose petals - the ones from the center of the flower are the best (the petals on the outside are usually too soft). Spread out the prettiest petals on a plate. Take a small bowl or a glass and put 8 table spoons of sugar in it. In a second glass you need to put 1 egg white with 1 tablespoon of water (mix them a little). 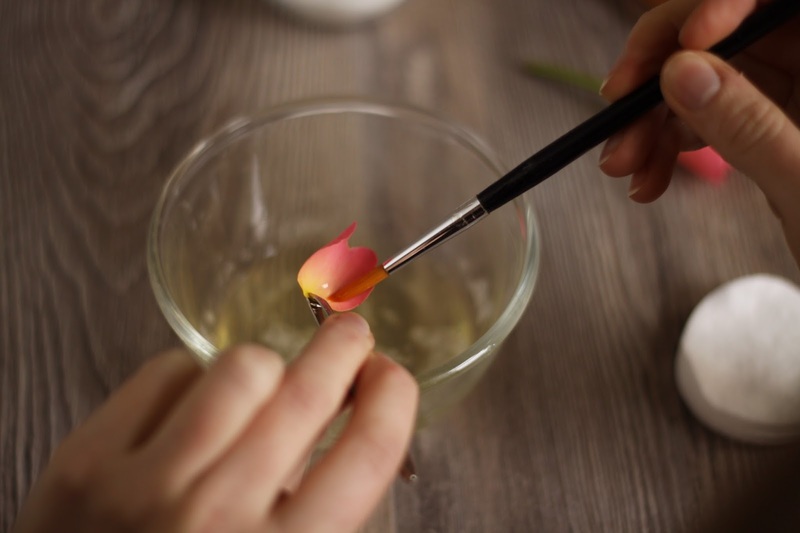 Gently hold the first petal with tweezers (hold the bottom part) and carefully cover it with the egg white with a brush. Make sure it is completely covered. Now hold that rose petal over the glass with sugar and sprinkle sugar on it. Make sure it is completely coated. Put it on baking parchment and let it dry. Repeat until you covered as many roses as you wanted. Let them dry overnight at room temperature. Next day you will end up with sweet rose chips that are perfect for decoration. Don't keep them longer than two days though. Peel and grate the ginger. Put it in a bowl and ad 200ml whip cream. If you want the cream to hold longer add some whip cream stabilizer. Mix with a hand held blender, put in a spout and put it in the fridge. In this recipe you will have to divide everything between two bowls. Put flour, sugar, baking soda and baking powder into two separate small bowls. Stir and set aside. Separate the eggs - two egg whites in first big bowl, two egg whites in a second big bowl, two egg yolks on third bowl, two egg whites in the fourth bowl. You get the idea. Into the bowls with egg yolks you need to add melted (but cooled off) butter or oil. Back to the big bowls - whisk the egg whites a little and add buttermilk. Whisk again. Pour egg yolks with butter into the big bowls with egg whites. You should now have two big bowl with equal amounts of all your liquid ingredients. This is the step where the difference comes in - add red food coloring into one of the bowls with liquids. Now pour little by little the dry ingredients into the big bowls - you should now have one red batter and one regular. Put both in the fridge for at least 20 minutes. Meanwhile preheat a well coated pan. You won't be using any oil, it is already in the batter. Use small heat on the stove. Make 4 small pancakes at the same time and flip when bubbles appear. Be careful with the red batter, they should not be too brown. After you are done flipping, pick out 3 red and 3 regular of your prettiest most even pancakes that re the same size. Use a heart shaped cookie cutter and carefully cut out the middle. 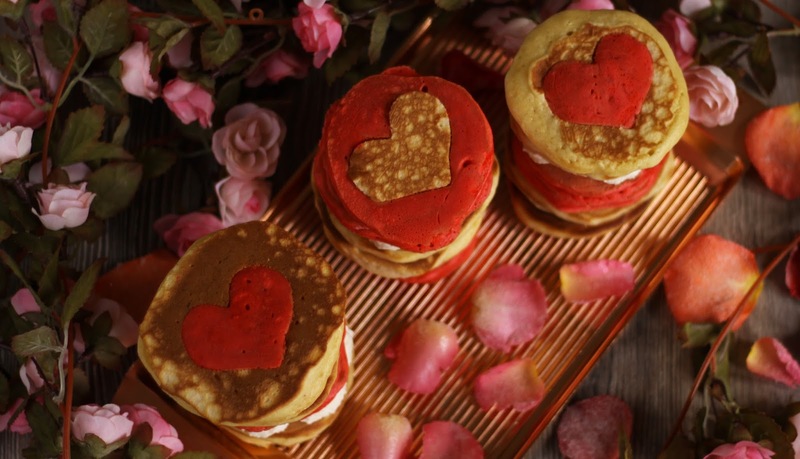 Put red hearts into white pancakes and white hearts into red pancakes. You can do that with all pancakes, we only did it on top. If your red tone is not perfect there is a trick - after you are done cutting color the red surface with a brush and food coloring mixed with a little water - it will make the brown tone from frying disappear and make them look more vibrant. Build 3 towers of pancakes and add the ginger cream between the pancakes. 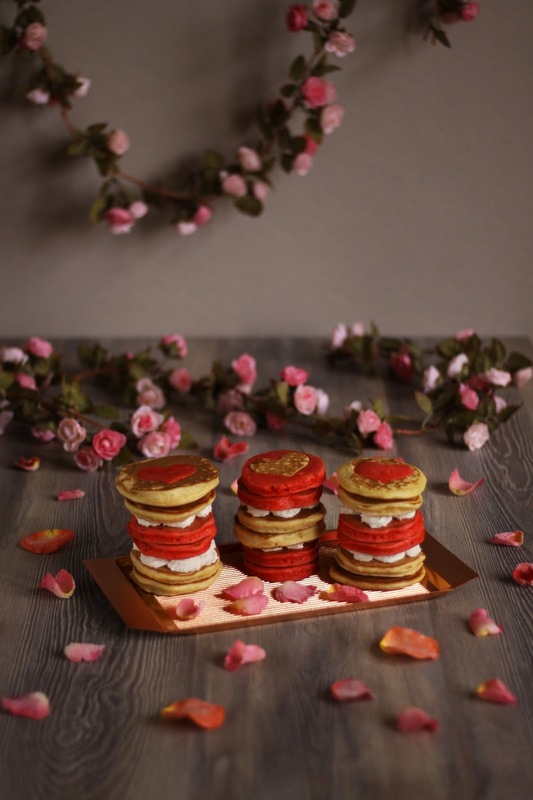 Decorate the plate with sugar coated rose petals and surprise your favorite person with a romantic meal!